I just returned from an 8 day trip to Las Vegas. It was my fourth time there. As always, I spent half my time in this city shaking my head. There is no other place quite like it and regardless of any pre-conceptions, it’s worth seeing at least once in my opinion. The main reason I was in Las Vegas was to attend the Star Trek Convention. And while I’m not a big Star Trek fan, a friend of mine had invited me to attend and I figured, why not? I’ll be writing a separate post soon about that bizarre experience. As for the city itself, I get a kick out of being here. And while I don’t really gamble and I’m not much of a party person, I always manage to have a good time. 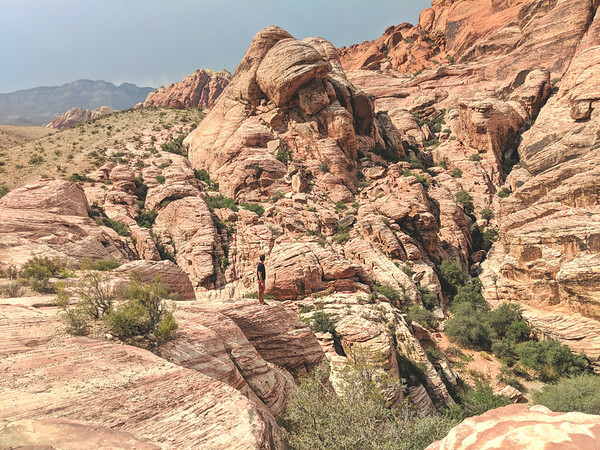 If you look hard enough, there really are some awesome things to do in Las Vegas, the kind of experiences that have little to do with the ‘Vegas’ that we think about. During my 8 day trip, I went to the ‘Strip’ only once and I gambled for about an hour total. So why was this such a great trip? Upside down, right side up, flip over again. Nose dives, barrel rolls, hammerhead stalls, loops and a backwards free fall. 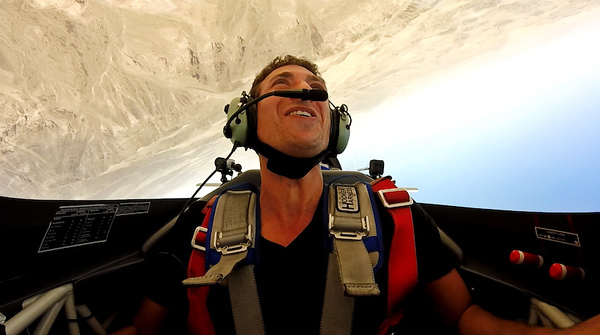 Those are some of the stunts you can experience when you step into the front seat of an advanced Extra 330LC stunt plane at Sky Combat Ace. After a thorough orientation, you board the plane, get strapped in and off you go. Over the next 12-15 minutes, your ex-Air Force fighter pilot (in command of the plane) will take you up in the air and start doing insane stunts. He’ll make sure you get up to speeds of almost 250 mph (400 km/hr) and if the barrel roll doesn’t cause you to vomit into a bag, your pilot will then take it up a notch. What does that mean? You’ll get to experience a Gravitational-force of around 6 or higher. As a reference, at a G-force of 7-9, most people apparently pass out. While I didn’t vomit and I didn’t pass out, when we hit close to 6, I felt as if my body and brain were sucked into a black hole and were melting away into infinity from the pressure. It was a most bizarre and intense few seconds, and I loved it! With the Explorer package, you’ll do about 3-5 stunts depending on how you feel up there. 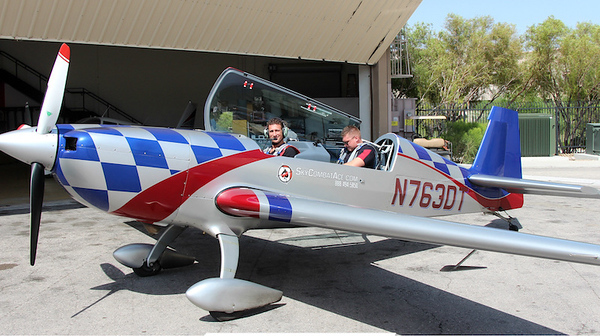 You can also choose other packages that include more stunts or allow you to fly the plane or where you can learn what it’s like to be in the midst of an aerial dogfight. Of course, they offer a video package as well, with cameras on the wings and in the cockpit recording all of your crazy reactions to every twist and flip and roll. My favorite moment was when my plane climbed straight up, completely perpendicular to the ground. Once it hit an altitude of about 5000 feet, the engine was cut and we entered into a free-fall straight back down…backwards. It’s as big of an adrenaline rush as you could ever imagine. Good luck and enjoy one of the best things to do in Las Vegas! Once you’re finished being a stunt person, you’ll probably want to take it easy for a couple of hours until your body adjusts from all the intensity. Head over to the Venetian Hotel and walk through the Grand Canal Shoppes until you almost reach the far end. That’s where you’ll find a most excellent Virtual Reality experience awaiting your arrival. 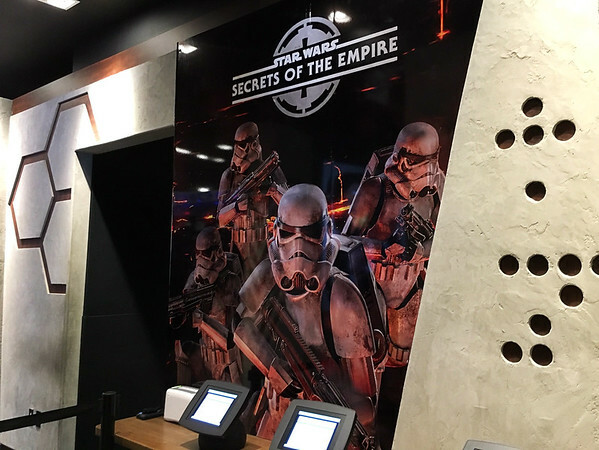 The Star Wars: Secrets of the Empire VR experience takes you straight into a surreal world where your commander gives you a mission to complete. You’ll go undercover, interact with Star Wars characters and do your best to achieve your objective. Wearing a computerized backpack, helmet, microphone and headset, the adventure is detailed and incredibly realistic as you wander through several different scenes and situations. Within a few seconds of putting the VR gear on, you’ll absolutely forget about the outside world. We came out of this with big smiles on our faces. To put it simply, it’s super fun. *You should make a reservation as only 5 people can go at a time and there are time slots every 15 minutes until about 11pm. The VR experience itself lasts approximately 15 minutes. This is my favorite place to eat in Las Vegas. It’s not on the Strip. It’s not a sit down restaurant. It’s nothing fancy or overly impressive from the outside. 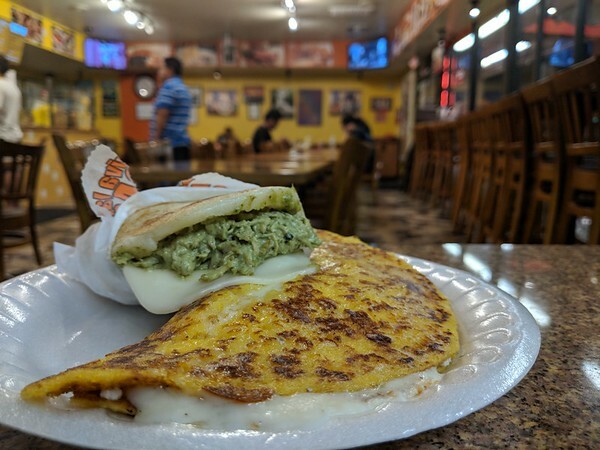 Viva Las Arepas is a simple, local Venezuelan eatery near downtown Las Vegas. Their famous arepas are served up nonstop, day and night, to a growing crowd of both locals and travelers who have heard about the place. It’s reputation is spreading, and for good reason. They have about 12 different kinds of arepas (the arepa cachapa and arepa reina pepiada are my favorites) and they also serve up empanadas. Each arepa only costs around $6 and it’s best to go there hungry because you’ll absolutely want at least two! You order at the counter and if you have any questions about the food, the staff are more than happy to assist. I took my friends here on our second night in Vegas and I was not surprised when they wanted to go back a few nights later. It’s worth the short trip from the Strip (less than 10 minutes away), especially if you’re tired of buffets and expensive meals. This stuff is as good as it gets! It’s time to make your way over to the unique Frankie’s Tiki Room. This Tiki bar is an institution. 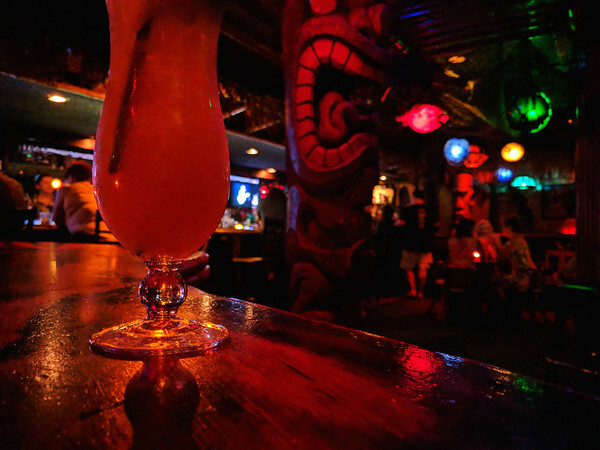 The bar itself has been around for 60 years and it’s been a Tiki bar since 2008. It’s also not on the Strip. It’s also close to downtown Vegas, right next to a gas station. However, don’t let that fool you and don’t let the fact that this local bar doesn’t have any windows stop you from going either. 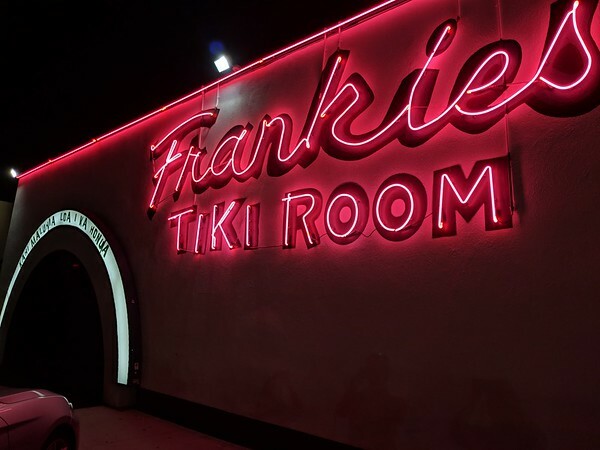 This is the real deal, designed by a famous Tiki bar designer, and unlike anything you can imagine. – We hung out for an hour and a half, drinking a couple of their unique cocktails. Sure, it might have been the cocktails talking but this is what happens every time I go there. What starts off as a weird experience, turns into a favorite bar. EVERY TIME. The atmosphere is laid-back, the lighting dark and there’s only room for about 40 people in the place. There are totem poles, carved wooden furniture, original artwork, torches and of course, their strange, yummy cocktails that everyone comes for. It’s a very welcoming place, even if you completely look like you’re not from the area. Nobody minds, just come on in! And that’s what makes it one of my favorite things to do in Las Vegas. Oh, it’s also open 24 hours. 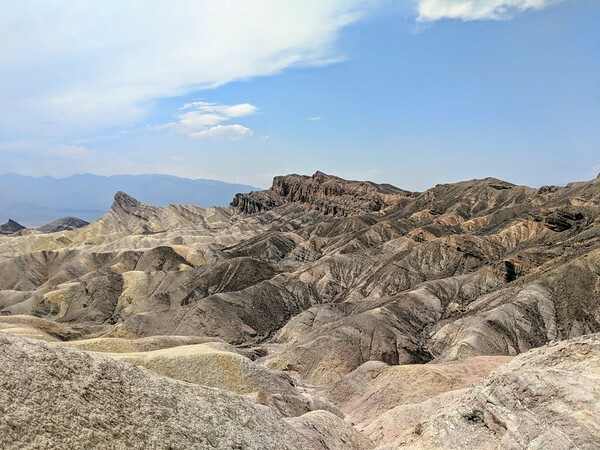 I was always curious about Death Valley and on this trip, I finally made it. Unfortunately, we went in the middle of summer. The day we were there, the temperature hit a ridiculous 123F (50.5C). It was brutal. However, it was also beautiful and well worth the trip. 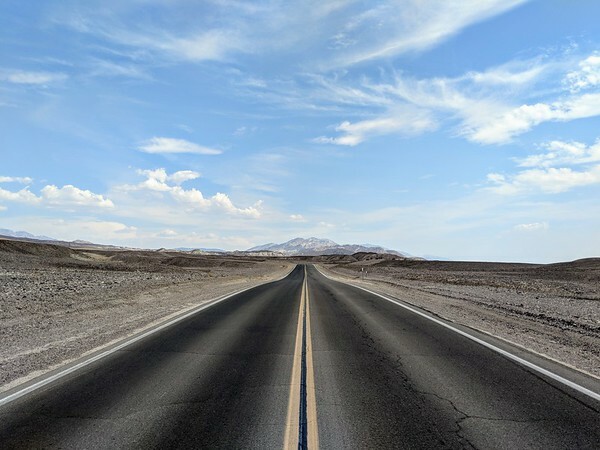 Only 2 hours away from Vegas along the scenic NV-160, Death Valley National Park offers a chance to see canyons, mountains, salt flats, hot springs, waterfalls, a Timbisha Shoshone Native American community, the lowest point in North America and one of the hottest spots in the world. 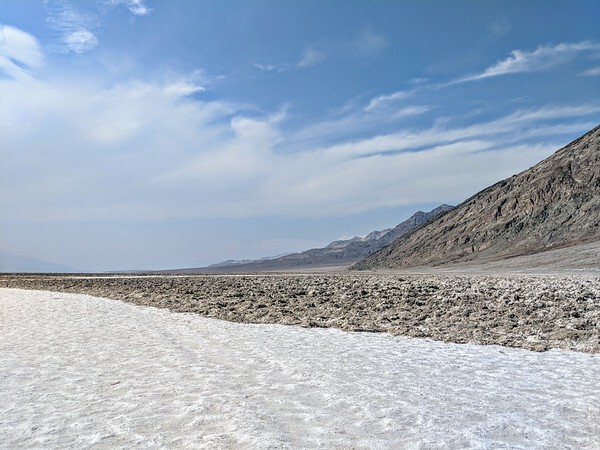 We stopped at Zabriskie Point, the village of Furnace Creek, Artist’s Drive and then we went for a short hike out to the Salt Flats at Badwater Basin. That last one is where the temperature reached 123F and we all almost passed out during the 30 minute hike. However, despite the burning nostrils and my shorts being soaked in sweat all day just from standing outside, it was all mesmerizing and stunning. Just please bring a ton of water, a hat, sunscreen, sunglasses and anything else that will help you handle the heat, especially if you go during the summer. *The entrance fee per vehicle is $30 that you pay at a little kiosk as you enter the park. With Death Valley out of the way, how about something a little more chill? Located only 30 minutes outside of Las Vegas, you won’t believe that you’re so close to a city once you enter this conservation area. It’s all incredible nature, in every direction. 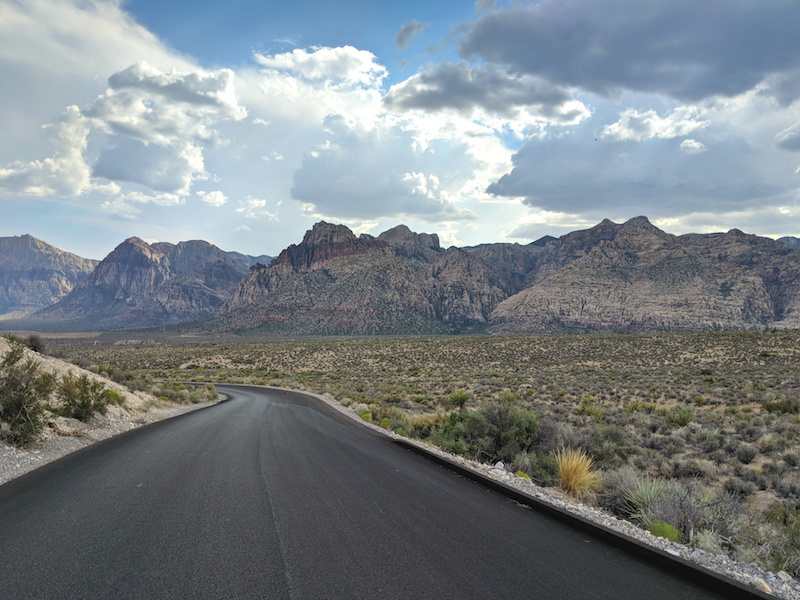 Set at the edge of the Mojave Desert, once you’re inside the Red Rock Canyon Conservation Area, there is a 13 mile scenic drive that loops all around. 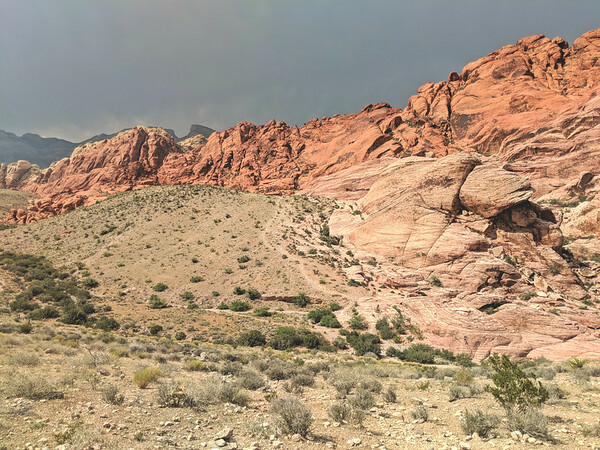 You’ll be able to stop at the Calico Basin and Bridge Mountain, check out the Joshua trees, sandstone formations and short trails that wind along the hills. There are plenty of longer hiking trails as well, ranging from 1 to 11 miles in length, and there are also opportunities for climbing. The red rocks are brilliantly red, the rocky mountains are imposing, the desert spreads out as far as you can see…you get the idea. Again, being only 30 minutes from the city, this peaceful location is the most ideal mini-escape from the madness and one of the best things to do in Las Vegas as a result. The photo at the top of this post is also from Red Rocks. *The cost to enter is $15 per vehicle. There are also picnic areas in case you want to bring some food. We spent about 2 hours going around the loop but you could easily spend half a day out there without even doing any major hikes. Are you ready for this kind of Vegas? Any other recommendations for cool things to do in Las Vegas? I love Viva Las Arepas! I’m glad I’m not the only one that gives downtown food the time of day when I’m in Vegas. If you’re ever back in the area, give “Carlitos Cuban Food” a try. It’s right by “Viva” and has the best Cuban cuisine in the city IMO! Loved the blog, Derek. The places that I am dying to visit in Las Vegas – Viva Las Arepas, Frankie’s Tiki Room and Death Valley National Park. Las Vegas is a place I wanted to visit since I started solo traveling. Thank you for all the recommendations. I think the only thing missing from this list is slamming white castle burgers and playing $1.00 roulette at Casino Royale, haha. Otherwise I fully endorse it! I love how many things there are to do in Las Vegas. The Tiki Bar sounds amazing, so hopefully I will get the opportunity to go. All the scenery you talked about also sounds beautiful and like such a fun adventure to explore! Thank you for sharing! Wow! Las Vegas is always fun. Thanks for sharing mate. I have traveled to Vegas for years and always do the same things. This gives me some fun alternatives for the next time I am out there. I will definitely put the Star Wars VR experience, Viva Las Arepas and Frankie’s Tiki Room on my list. Thanks! Wow! Las Vegas has so much to offer, Derek! I’d love to experience those air stunts as I am an adventure junkie. 🙂 Thanks for causing the travel bug to itch me! I have a pretty severe fear of flying and heights, but that combat plane flight still looks like amazing fun! Hey Kathi – Ha, there really is a good mix and I will try to get to Valley of Fire on my next visit! Those Arepas look so good! I’d also love to try the Star Wars VR! Seems like a lot of fun!